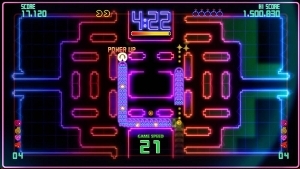 I recently picked up the pac-man remake, and decided to share my thoughts about a couple of other 80's remakes along with it, running the gamut from amazing to unplayable. What they've done here is brilliant. Even as a child, Pac-Man was a "pick-it-up, play it until I got bored" game. This is an addiction. First of all, it's not an infinite game like the classic... it's a series of challenges ranging from one to ten minutes. So I go into it thinking I'm just going to blow a few minutes and then go do something productive, but it turns into a series of 'just one more game'. 'Pac-Man on crack' really describes it well, because it's keeps building up to ludicrous speed and becomes something of an adrenaline rush. "But I die within a minute at regular speed," you say. Well, there are two major differences here. First... when a ghost comes within striking range, the action freezes for about two seconds to give you a chance to change directions or, if no escape is possible, to use one of a limited number of bombs you have. Second, the ghosts aren't as smart, most of them just line up behind you, and before long you have a few dozen on your trail. And that's part of the fun... building up a huge ghost tail until you finally grab that power pellet and plow through the ghosts like a senior citizen driving through a flea market. There are also a lot of different maze colors schemes and character designs (ranging from overly pixellated to 3D... it's like the art team came up with several concepts and they couldn't just choose one, so they said 'screw it... let's include them all. The different mazes all default to different styles for you to experience, but you can modify them to whatever you want. The familiar sounds are all there... 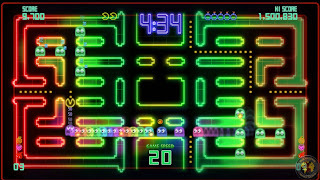 I can't emphasize enough how crazy it is that it can feel so much like pac-man and yet be so different at the same time. This game is part of a "Namco Generations" line which is going to be doing Galaga next, and Galaga was the best of the best to start with, so I'll be on board for that one. But I really hope they'll hit Dig Dug at some point. It's a concept that always drew me in but lacked that something that put it at a level with other games. 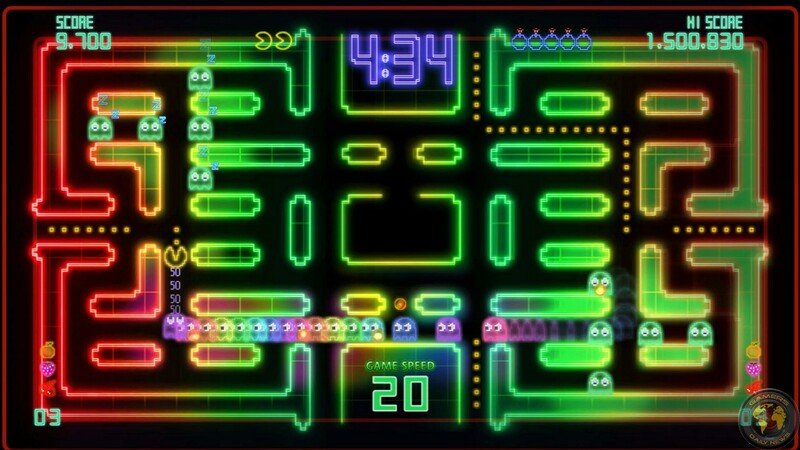 I know that there are two versions of this Pac-Man remake. This is the more expensive one ($9.99 currently on sale for $7.49, I believe), and I don't know how it differs from the cheaper one. But the one I played I give the absolute highest recommendation. If there's any part of you that loves old 80's games, you absolutely have to have this. The theme here is evolution. The first level is space invaders, and from there the invader evolve, and you evolve. And so it becomes something different while still feeling faithful. And it rewards continued play because every time you beat yet another level, you unlock something new. I think I got to the point that I kept playing just to see if they would run out of stuff to unlock. They have a music mode in here where they make a level that integrates music on your hard drive. 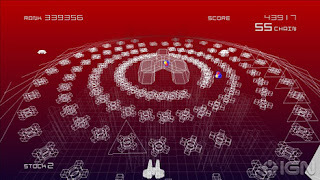 I tried several of my favorite songs with it, but i never got the sense that the level was really flowing with the music in any substantial way. Then there would always be a boss fight at the end of the song. The very end... so the song restarts, and I've beaten the boss before it gets to the first chorus. It comes off really awkward. If I ever hear of a game that would make me feel like I'm playing a game shaped by my music, I'd be all over it. I did get a fair bit of enjoyment out of the game before I hit that wall, and based on that, I give this a mild recommendation. 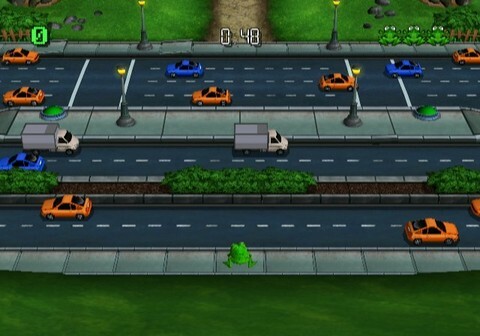 A frogger remake, and it's only $5? How can you not at least give it a try? I'll tell you.. because it's completely unplayable. I kid you not. I would have had more fun lighting a $5 bill on fire and watching it burn. The controls feel laggy. I didn't always know where I could and could not jump. And I couldn't always tell if I was completely in a safe lane, leading to even more deaths. I think I played this for about thirty minutes and then DELETED IT. Avoid. Avoid. Avoid. I just wish this was online multiplayer. Would have given it a more Arcade feel. 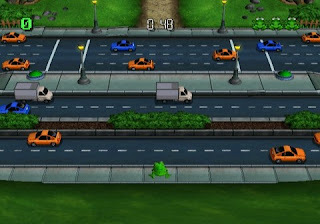 Frogger has never been one of my fav games, but you made this version sound like complete rubbish.